The Eixample area could be described in three words: graceful, elegant, extensive. 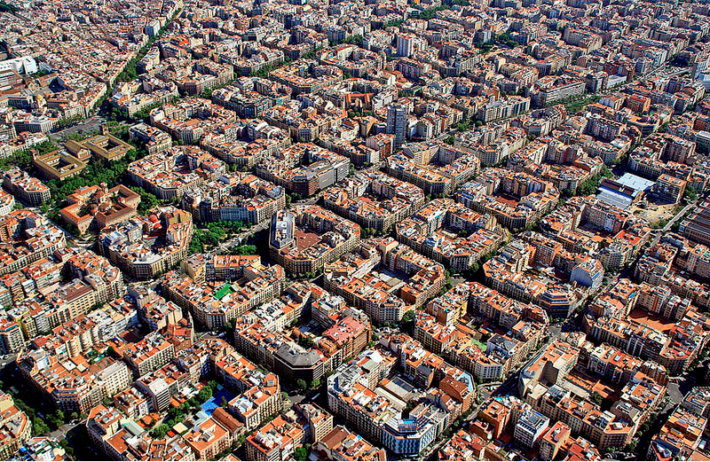 Eixample is famous for a geometric grid, consisting of blocks of similar buildings, which goes from the Gothic Quarter until Gracia. At the beginning of the 1900s, the area became the Catalan modernist centre with its most outstanding examples in an area known as the Golden Quarter (‘Quadrat d’or’). In the Eixample, the only imperative is to walk looking up to for the surprises offered by modernist architecture on every street & corner. 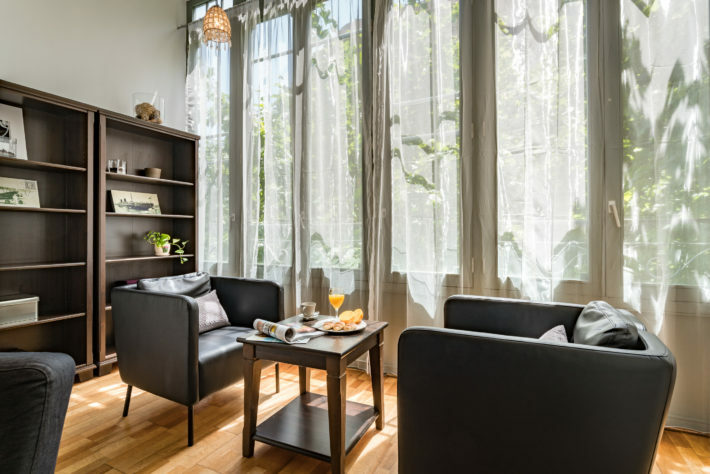 Alibei 1 is located in Calle Ali Bei, between Calle Bailen and Passeig de Sant Joan. 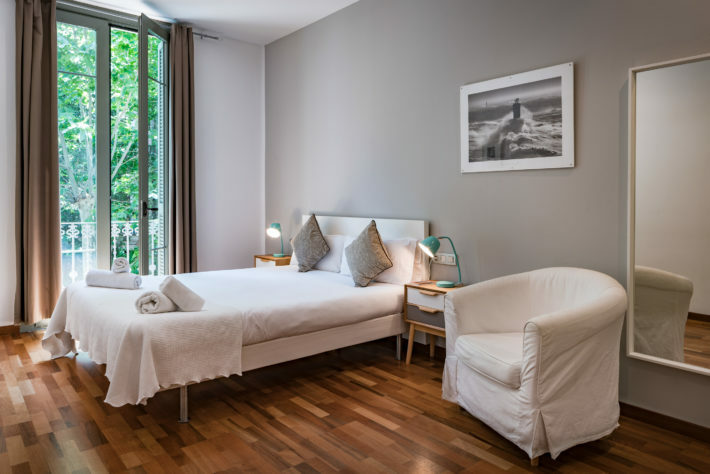 This is very much the centre of Barcelona − a 10-minute walk from Plaza Cataluña, Las Ramblas and the Barrio Gótico, a 15-minute walk from Passeig de Gracia, the city’s most prestigious shopping street and home to two of Barcelona’s architectural gems: Casa Milà and Casa Batlló, both by Antoni Gaudí. The street next to the apartment is home to some interesting restaurants as well as a variety of shops, grocery stores and a supermarket. You can find a bus station and a metro station with lines L1 and L2 passing through nearby. Arc de Triomf − 0.19 km. The Arc de Triomf is an archway built as a memorial or triumph arch and was the main access gate for the 1888 Barcelona World Fair. Parc de la Ciutadella − 0.52 km. The Parc de la Ciutadella is located on the edge of the old town and a great spot to escape the bustle of the city to have a picnic. The renovated Alibei 1 apartment features a spacious living room area, three bedrooms, two bathrooms and a fully equipped kitchen. 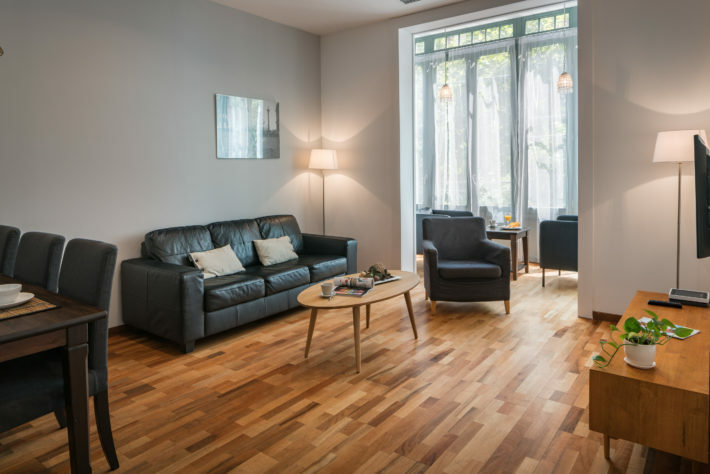 Alibei 1 has a beautiful living room with tall windows, giving it an even more spacious impression and making it a great place to hang out together. This apartment can accommodate up to 6 people, which makes it a perfect place for families with kids or small groups of friends. Planning a Barcelona getaway with your family or friends? Book your stay at Alibei 1 or check out the full list of Habitat Apartments we offer here.